Below is an outline of the steps for buying tickets for our courses and events. NB: Even if you have already logged in, you will still need to do Step TWO to get the discount. 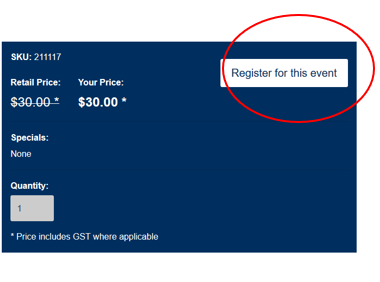 When you are in the event/course page, scroll to the bottom of the page. The price shown is the non-member price. This can be changed at Step TWO. Click on Register for this event. Select the number of tickets you want. Please note that if you are buying on behalf of someone who is either not a member or is a different category of membership, we will invoice you for the difference if that person was not entitled to the discount received. 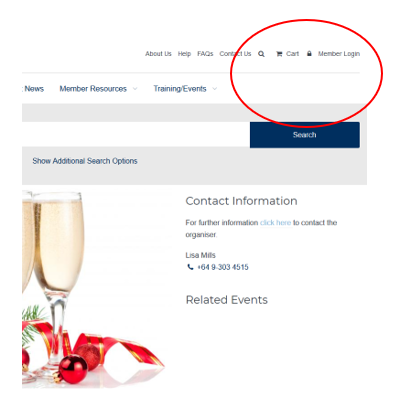 Enter the email address that is associated with your membership. 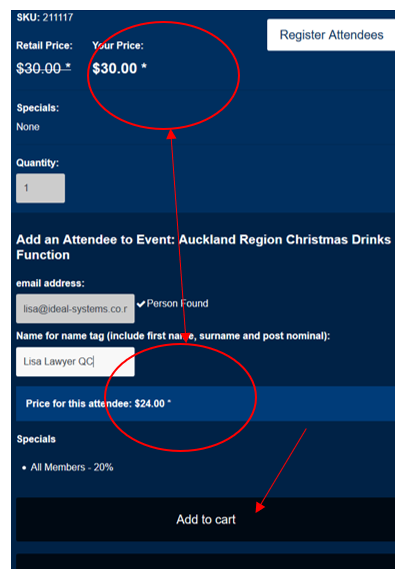 If you have not put in the email address attached to your membership, you will not be recognised as a member for discount and billing purposes. Press LOOK UP. If you have an existing record on the system, this will be retrieved and the correct price will appear lower down on the screen (see diagram). Choose ADD TO CART. If you want you can add more tickets, or if you are done, GO STRAIGHT TO STEP THREE. Scroll up to the top of the page and click on CART in the top menu. Review your details. You can change the number of tickets purchased. Make sure you update your cart. if the details are correct, proceed to checkout. Login when prompted (if you are not already logged in). If you are not a member and have never registered on our system you will be asked to create a user account. This will allow you to be charged and have a ticket issued. Complete billing/payment information. You can add to your account (pay on invoice) or pay by Visa/Mastercard or POLi (internet banking). Confirm order – and you are done! You will receive a confirmation email of your registration.